Spring and pearls go together like champagne and strawberries. 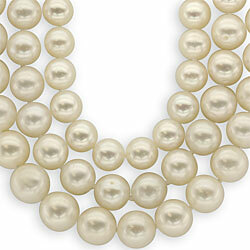 Pearls add a touch of elegance, sophistication and old-world charm. They also blend flawlessly with so many outfits, from a silky black gown down to a pair of jeans and a t-shirt. Single strand cultured freshwater pearls, 17″ with 14kt yellow gold clasp and free matching earrings.